Welcome to the latest edition of our new weekly blog series, Recommended Reading. Each week, I’ll highlight something – either a book, or a blog, or a publication – marketers should read. I’ll give a brief summary and tell you why it’s important. Last Week’s Recommendation was Hooked: How to Build Habit Forming Products, by Nir Eyal. The 22 laws mentioned in the book’s title form the outline to this hidden gem in the marketing world. 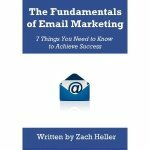 The book’s authors, Al Ries and Jack Trout, write in a clear and folksy tone, explaining quite simply what marketing tactics work and why. Violate them at your own risk, it says right under the title on the cover of the book. And we find out why, as each “law” contains real-world evidence supporting it. For marketers, this is as close to we get as a “one size fits all” solution. Each chapter will explain one of the 22 laws, and you’ll begin to get ideas on how you can use that in your own business. By the end of the book, you’ll know plenty of things about marketing that you didn’t know when you started. And you’ll have some real tactics that you can use to help grow your business. Order 22 Immutable Laws of Marketing on Amazon now. Do you have recommended reading for marketers? Use our contact form or the comments below to let us know about it.